RAISE UR PAW NEWS: A MUST READ: SAVE THE SEALS: GLOBAL MOVEMENT --- MARCH FOR LIFE! Please Help Today! 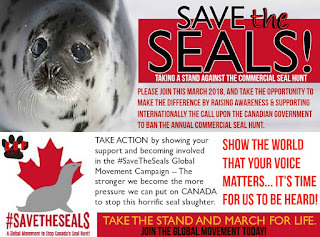 A MUST READ: SAVE THE SEALS: GLOBAL MOVEMENT --- MARCH FOR LIFE! Please Help Today! As we approach another year of Canada's annual commercial seal hunt, we acknowledge and appreciate with much thanks to the countless outcries and awareness that is being brought by worldwide communities ( individuals and organizations) demanding with much pressure and urgency towards the Canadian Government to ban this seal harvest once and for all. However, due to the lack of acknowledgement and attention that is being received from the Canadian Government and those of political power and influence involved on this issue, we at Raise Ur Paw, a Canadian Federally Incorporated Not-For-Profit are establishing a march to Save The Seals -- which we plan to hold in March 2018 in Ottawa, Ontario, bringing with us not only the countless international signatures provided on this petition but also hoping to gather worldwide support and participation from individuals and organizations, joining us and uniting our voices as we make this imperative stand. With your support and participation in March to Save The Seals, you are not only raising public awareness on the inhumanity and cruelty that goes hand in hand with this annual seal slaughter, and speaking up for the countless lives of these sentient beings, in which suffer and die at the hands of a dying industry --- but you are making a united stand globally to demand that your voice be heard and acknowledged as we go the distance to urgently pressure the Canadian Government to remove this dying industry from the life support that they have kept it on for way too long. We as compassionate individuals of humanity need to advocate for the safety and protection of innocent life --- for their survival, welfare, and well-being, and be active role models that show the world that we believe that all innocent life matters & should not be treated in a way that subjects them to such inhumanity and cruelty for any means. THE TIME IS NOW TO MAKE A STAND --- AND BE PART OF THE ACTION TO MAKING THIS HISTORIC STEP. WILL YOU MARCH WITH US? WILL YOU BE PART OF THE GLOBAL MOVEMENT TO #SAVETHESEALS? We Thank you all from the bottom of our hearts for being the voices that are desperately needed at this time. You can follow us on twitter @RaiseUrPaw and be part of the action.